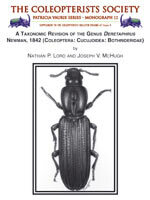 A Taxonomic Revision of the Genus Deretaphrus Newman (Coleoptera: Bothrideridae), by Nathan P. Lord and Joseph V. McHugh. 107pp. A revision of the genus Deretaphrus Newman, 1842 (Coleoptera: Bothrideridae) is presented. Deretaphrus is a predominantly Australian genus (22 species), although single species are also present in New Caledonia, Bolivia, and the Pacific Northwest USA. Members of the genus are large (5-13 mm) and commonly collected. Deretaphrus larvae are ectoparasitic on wood-boring insects and may pose some utility as biological control agents. Approximately 1,900 specimens were borrowed from 44 collections and museums, representing the majority of the world’s total holdings. A taxonomic treatment of the genus was conducted and all known species are herein described and figured. A key is provided to the world species, and information about the natural history and ecology of the group is presented. Twenty-five species are recognized, including seven new species described herein: Deretaphrus antennatus Lord and McHugh, new species, Deretaphrus boliviensis Lord and McHugh, new species, Deretaphrus carinatus Lord and McHugh, new species, Deretaphrus hoplites Lord and McHugh, new species, Deretaphrus lateropunctatus Lord and McHugh, new species, Deretaphrus ocularis Lord and McHugh, new species, and Deretaphrus rodmani Lord and McHugh, new species. Two new junior synonyms are reported: Deretaphrus cribriceps Blackburn and Deretaphrus popularis Blackburn are placed under Deretaphrus viduatus Pascoe, new synonymies. Two former junior synonyms, Deretaphrus bucculentus Elston, new status (from Deretaphrus puncticollis Lea) and Deretaphrus iridescens Blackburn, new status (from Deretaphrus gracilis Blackburn), are removed from synonymy. Neotypes are designated for two species: Deretaphrus fossus Newman and Deretaphrus wollastoni Newman. Lectotypes are designated for 23 nominal species: Deretaphrus aequaliceps Blackburn, Deretaphrus analis Lea, Deretaphrus bakewellii Pascoe, Deretaphrus cordicollis Blackburn, Deretaphrus colydioides Pascoe, Deretaphrus cribriceps Blackburn, Deretaphrus erichsoni Newman, D. gracilis, Deretaphrus granulipennis Reitter, Deretaphrus ignarus Pascoe, Deretaphrus incultus Carter and Zeck, Deretaphrus interruptus Grouvelle, Deretaphrus iridescens Blackburn, Deretaphrus oregonensis Horn, Deretaphrus parviceps Lea, Deretaphrus pascoei Macleay, Deretaphrus piceus (Germar), Deretaphrus popularis Blackburn, D. puncticollis, Deretaphrus sparsiceps Blackburn, Deretaphrus thoracicus Blackburn, D. viduatus, and Deretaphrus xanthorrhoeae Lea. Paralectotypes are designated for D. analis (2), D. incultus (3), D. interruptus (2), D. oregonensis (7), D. pascoei (2), D. piceus (1), D. sparsiceps (1), and D. xanthorrhoeae.